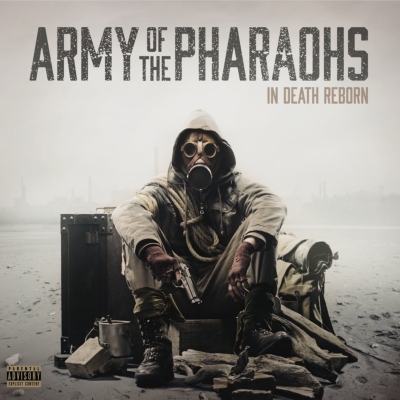 Initiated in 1998 by Jedi Mind Tricks frontman Vinnie Paz as homage to the incredible rap crews of the 80 s and early 90 s, the Army of the Pharaohs has, from it's outset, been an ever-evolving collective of celebrated emcees from the indie hip-hop scene. Founding members Vinnie Paz and Esoteric were featured on the crew's original 12-inch single, 'Five Perfect Exertions,' in 1998 and remain with the crew today. With the release of their debut studio album THE TORTURE PAPERS in 2006, the Pharaoh clique expanded to include accomplished solo emcees Apathy, Celph Titled, King Syze, Reef the Lost Cauze, and the Philly hip-hop duo and frequent Jedi Mind Tricks collaborators, Outer space. In it's nearly two decades, AOTP has released three studio albums alongside countless solo albums and side projects from it's lineup of emcees that have been some of the most critically-acclaimed and best-selling indie hip hop records of the past 20 years. IN DEATH REBORN also features appearances by Blacastan, Zilla, Block McCloud, Demoz, Doap Nixon, King Magnetic & Lawrence Arnell.